No tickets to tonight’s game? 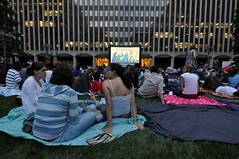 Here’s another option for outdoor entertainment: the U Street Movie Series. This summer movie series kicks off tonight with This Is It. Gates open at Harrison Field at 7 PM, and the movie will start at 8:30. And if you’re one of the first 100 people there, you’ll get free popcorn! Music-themed movies will be shown at Harrison Field on the second Tuesday of every month this summer, so mark your calendar for Buena Vista Social Club on July 13, The Soloist on August 10, and Soul Power and Duke Ellington’s Washington on September 14.